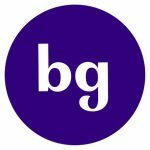 The following post is an honest review of Rotimatic — the smart cooking device that automates the flatbread making process. Save $268 by using discount code BLACKFRIDAY at checkout. Rotis (aka flatbreads) have to be eaten fresh and making them at home is tedious and requires skill. With more millennials leading busy Indo-Western lifestyles, we have been forced to resort to frozen, unhealthy alternatives, or by replacing flatbreads with other forms of carbs. Founded in 2008, Rotimatic is the disruptive solution to this unaddressed problem. It combines cutting-edge, AI-driven technology with internet connectivity to create the ultimate smart cooking device that automates the flatbread making process. “Raising series C, for such a futuristic kitchen robotic product signals the coming of age of this invention. With support from our existing investors such as Robert Bosch Venture Capital and NSI Ventures and with new partners such as Credence and EDBI, we are poised to take the kitchen industry by storm. 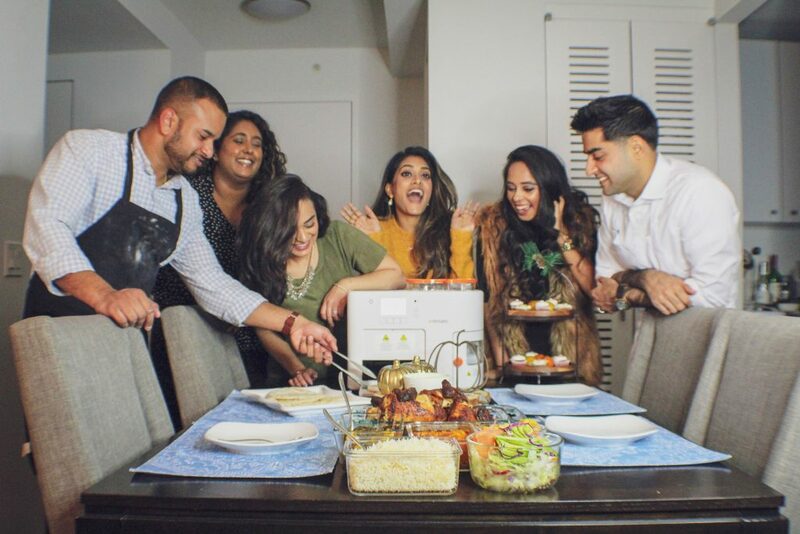 Our New York City Brown Girl team organized a mini Friendsgiving dinner to give the much-raved about Rotimatic machine a try. The menu included Pio Pio’s classic rotisserie chicken, and a local South Asian restaurant’s saag paneer, butter chicken, fried cauliflower, salad and rice, mithai and carrot cupcakes for dessert, but of course, in this case, the entree was most certainly the rotis. Curious, excited and hungry — we gathered around to assemble the appliance. The machine itself is 16×16 and 44lbs so placing it on the dining table (we added a heat resistant cover underneath) was the best bet since New York City kitchen counters are not as spacious. Once connected to WiFi, and after a quick download of the Rotimatic app, it upgraded itself to the latest software update and provided remote troubleshooting capabilities, which was much-needed. The assembly process was not bad at all, it took a few steps and the manual with photos made it easy to do. The cool part was, exact measurements were not required for the ingredients so we filled the flour, oil and (room temperature) water into the storage containers (which do not need to cleaned after every use) with a healthy amount of each, and the Rotimatic will automatically measure the amount required. We then selected the brand of flour we were using (Pillsbury in our case), the thickness of our roti, the roast level and oil preference along with how many rotis we wanted — we chose 10. 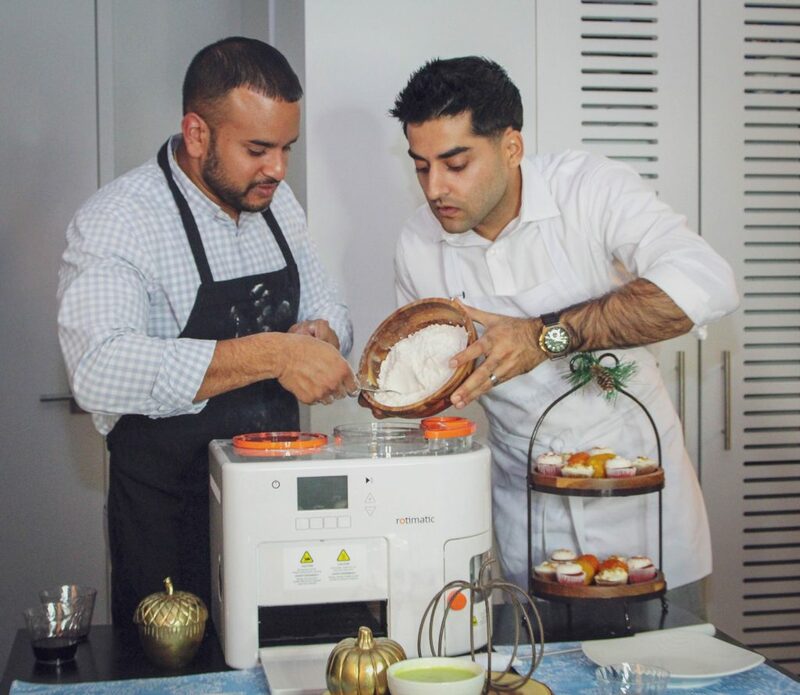 Since the user manual and machine states the “Rotimatic gets smarter over time” and empowers you to do more and get creative — we figured it would take us and the machine both several tries to get the rotis just right. Expect some noise at times at the beginning of the roti-making cycle, as Rotimatic is trying to detect the placement of the stirrer. For the first few tries, our machine was only producing a ball of dough but even then, we were impressed by its circular shape and consistency, so we knew we were onto something tasty. It also learns and improves the dough quality over time. Rotimatic uses the information from the first few dough balls to adjust its dough formations. Once a freshly-puffed roti appeared almost magically through the machine, the rest took almost no time to make. 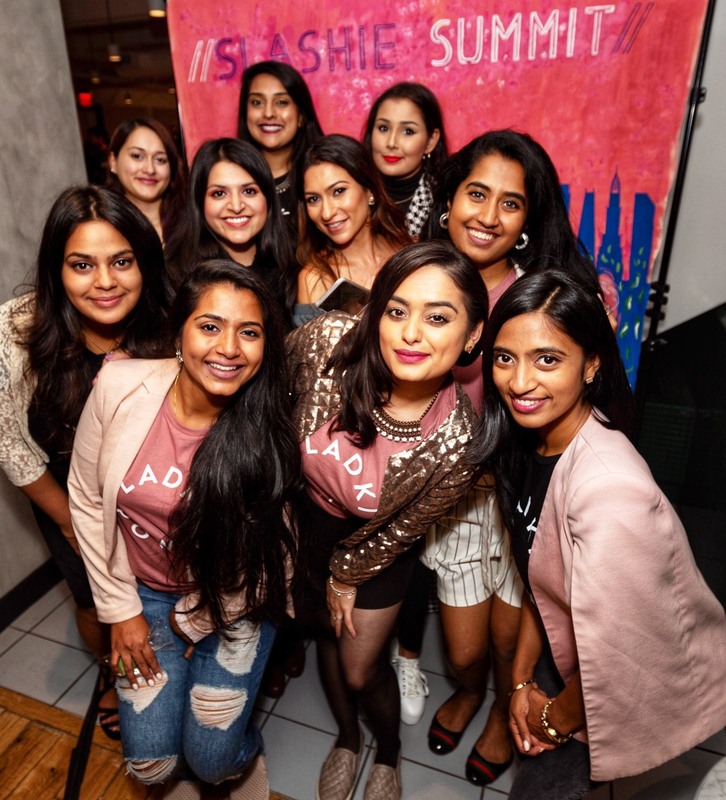 Below are testimonials from our Friendsgiving dinner crew — which included CEO and co-founder Trisha Sakhuja-Walia, photographer of the evening and Brown Girl editor, Kamini Ramdeen and her boyfriend, Rafiq Chowdhury, and long-time Brown Girl contributors Ashni Mehta, Christine Varickamackal, Sumona and her husband Binny Seth. The Rotimatic was an impressive cooking machine with minimal initial steps required. The directions were concise and the images certainly helped instruct the user on how to properly make the roti. I was most impressed by the self-calibration. This feature eliminated the need of precise measurements to be taken which can sometimes be the enemy of the novice cook. 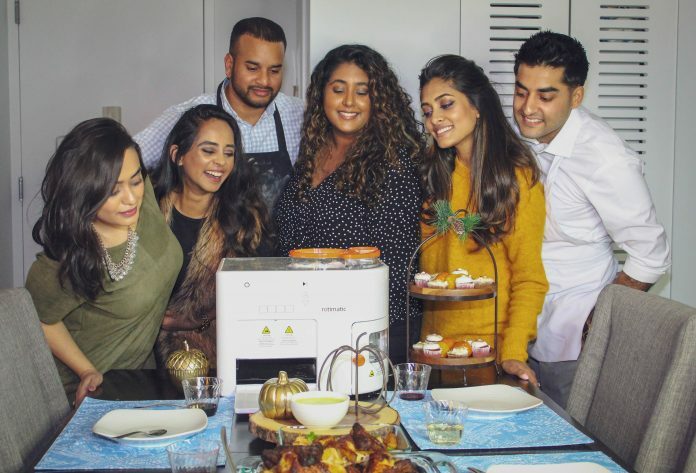 The Rotimatic alleviates the time (and mess) it takes to make roti allowing the family chef or dinner hosts to focus on the primary items of their meal. 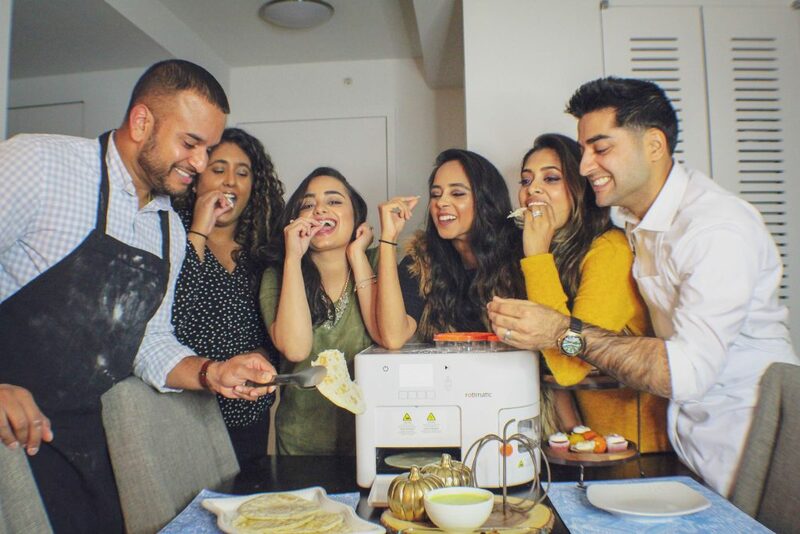 By introducing the Rotimatic to your kitchen, not only will you have easy access to a delicious addition to every meal, but you’ll retain roti in it’s position as a staple in Indian cuisine. 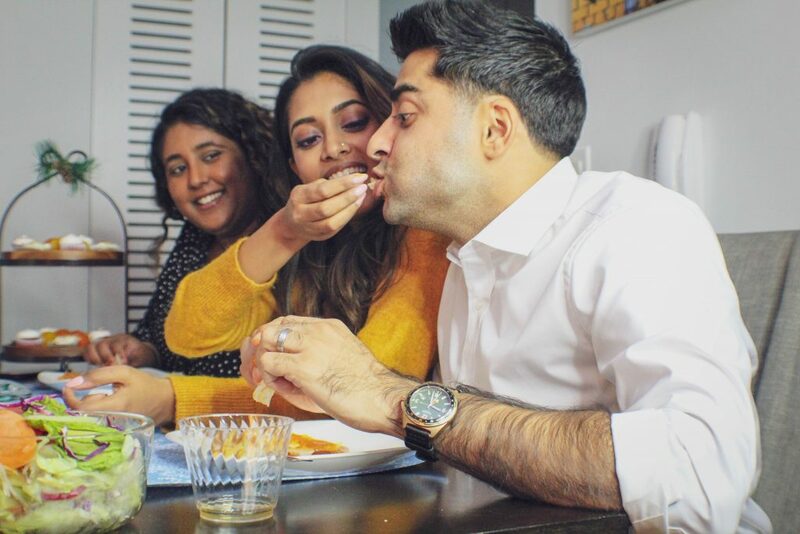 When that first roti slid out, we were like two kids back in the day when our moms would whip up our favorite meal, so let’s just say the excitement was real. But in all honestly, the Rotimatic held up to the hype of being an efficiently automated roti-making machine. As a millennial couple, we’re both faced with working full-time jobs, side hustles (shout out to all the slashies!) and handling the bustle of everyday living in New York City. So, it goes without saying that the Rotimatic fits in quite well with our lifestyle. Also, aside from smooth aesthetics and compact size, which we didn’t expect, the Rotimatic was pretty much a breeze to set up since the instructions were very clear with pictures. As for the quality of the roti, we loved the light and flakey texture! The both of us were definitely swirling with thoughts of our moms’ cooking, as we were digging into some roti and chicken tikka masala. We’re grateful that Rotimatic allows us to hold onto parts of our culture that we once took for granted. As someone who loves to eat roti but doesn’t have the time to make it, this machine was perfect to use. The instructions were clear and it’s mentioned a couple of times in the manual that this was a learning machine. There were some kinks that we worked out in the beginning but in the end, we had 10 rotis that were hot and ready for us to eat. The machine figures out the flour, water, and oil measurements for you. I wasn’t expecting that at all and it took the stress out of figuring it out. I thought this feature was great to have because it allows more focus on other items in your meal or gives you some downtime after cooking. The touch screen options on the machine were self explanatory and easy to use. Watching the rotis being made, it reminded me of watching my mother go through the process of making rotis from scratch. It gave me more appreciation of how much time and energy my mother put into her meals. This machine cuts the prepping and cooking time for rotis in half and is a step towards keeping the culture alive within the home. For the busy adult who misses freshly made rotis, this machine would be a great fit in your home. The Rotimatic truly takes all the fuss and mess out of making fresh round rotis! As someone that has a full time career and pursues multiple side hustles, knowing that I can quickly throw ingredients into the rotimatic, catch up on some work, and have hot rotis in less than 10 minutes is a total game changer. 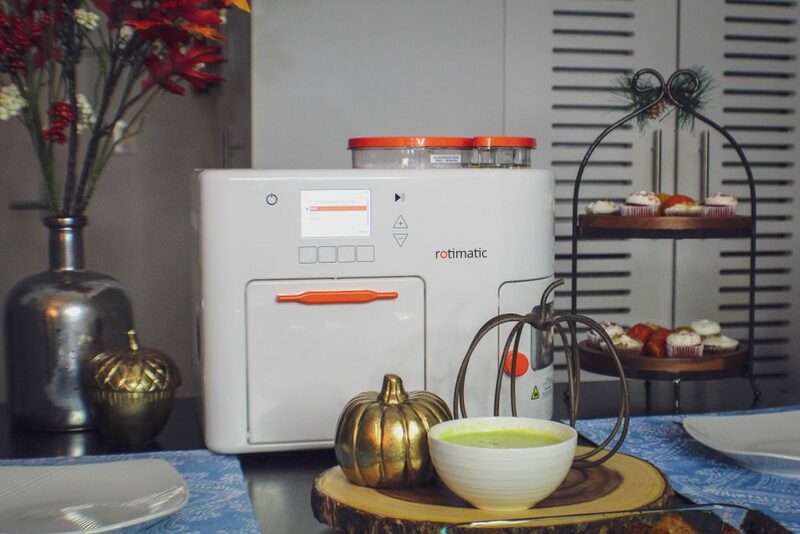 The Rotimatic learns as it goes and even allows you to customize your roti consistency to just the way you like it. 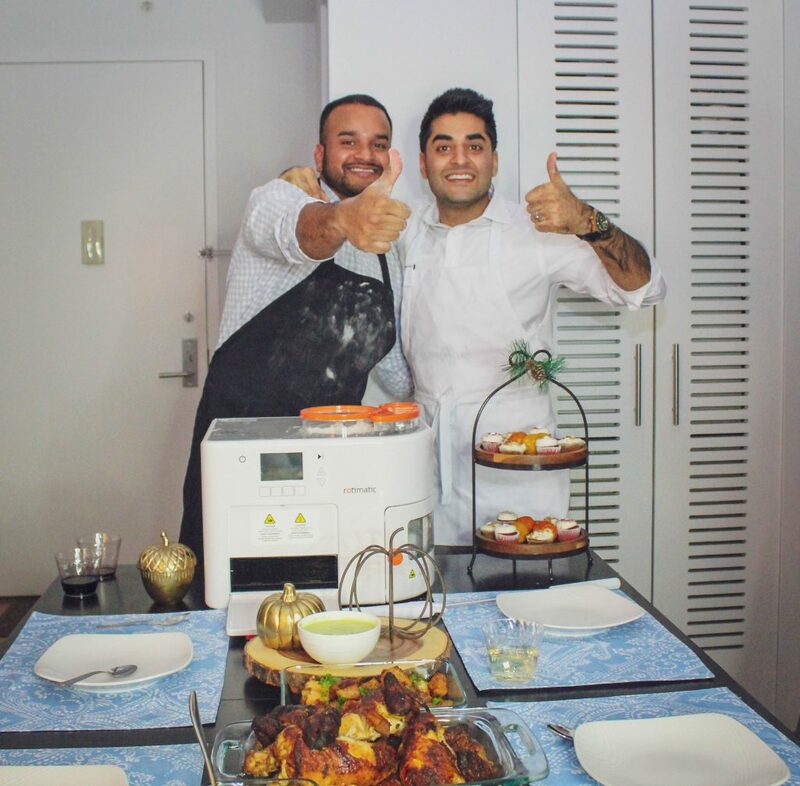 After a few kinks during the initial set up, the Rotimatic was churning out hot, delicious rotis in no time. And there’s even an app that connects with your phone to allow you to troubleshoot while making your roti. Add some ghee for a final touch, and you’ll have a roti almost as good as the ones your mom makes! As a young professional, I truly believed that cooking and having the traditional Gujarati meals I grew up eating (RDBS, amirite?) were just something I’d never be able to fit into my fast-paced lifestyle. Thanks to rotimatic, cooking some of my favorite Gujju meals finally seems within reach — aka I’ll be eating bhindi for DAYS. Its IoT and AI capabilities make it a one-of-a-kind investment for households that aim to lead a healthier lifestyle at a touch of a button. Rotimatic ($999) is now available in the USA, U.K., Australia, New Zealand, Singapore, the Middle East and Canada via rotimatic.com.